BitFlow, a manufacturer of machine vision components used in robotics, automation systems and quality control, recently introduced its Aon-CXP CoaXPress single-link frame grabber that is fast gaining supporters among former USB 3.1 users. Although the Aon-CXP is inexpensive and compact, it packs all the power of larger, multi-link CXP frame grabbers, delivering up to 6.25 Gb/S worth of data over the link, or almost twice the real world data rate of the USB3 Vision standard. 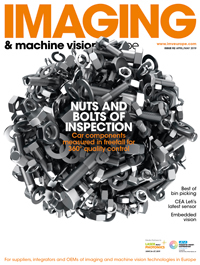 "In today's thriving machine vision industry, USB 3.1 is recognized as a simple, cost-effective plug-and-play interface for lower bandwidth applications," said Donal Waide, Director of Sales at BitFlow. "However, a new generation of CoaXPress (CXP) single-link cameras combined with the Aon-CXP are challenging USB 3.1's long held dominance. Many system integrators are finding they can acquire 2-megapixel images at up to 300 frames per second for approximately the same system cost as USB 3.1 with far fewer hassles and longer cable lengths." In its simplest form, says Waide, a CoaXPress vision system can be developed using only a desktop PC featuring a PCI interface, the Aon-CXP frame grabber, a standard coax cable up to 40 meters, and a single-link CXP camera. Configuration software included with the Aon-CXP locates the camera and immediately begins acquiring images. The standard argument against this approach is the cost of the CXP frame grabber, a component that is not required by USB 3.1. Yet this argument falls apart when one realizes that USB 3.1's maximum speed is 382 MB/S, while the single link CXP solution runs at approximately 600 MB/S, or almost twice as fast. For what amounts to essentially the same price, this additional speed can be a key advantage a company can take over it's competition in several industrial applications. Above 400 MB/s (2.4 Gbps) CoaXPress wins hands down because USB 3.1 simply can't handle the speed. Another factor working against the USB 3.1 interface is increased latency and image jitter. Without the Aon-CXP frame grabber to conduct processing functions the USB 3.1 interface depends on the PC for power, stealing CPU cycles away from the image processing function of the PC, resulting in slower, less accurate imaging. These functions include such basics as triggering, strobes, camera synching, waveform generators, or quadrature encoders. With the latest version of CoaXPress (CXP 2.0) on the horizon pushing single lane speeds up to 12.5 Gbps, CXP solutions like the Aon-CXP become a cost-effective alternative to USB 3.1 for higher resolution, higher frame rate applications. Additionally, at 400 MByte/s, USB 3.1's highest data rate is not much greater than base Camera Link, so full support for some current and probably all next-generation sensors is unlikely.